As the weather changes in Southern California we get those strong Santa Ana winds. These winds blow debris from trees and other sources onto your roof. And then when it rains all that debris goes right into your gutters. It adds up over time faster than you think. Then before you know it your gutters are flowing water over the edge instead of down the spouts. This creates havoc in floods and slip-and-fall issues. Who wants all that trouble? Probably not you and neither do your HOA residents. So what do you do? Well, clean them. Easier said than done right? Not for us! That’s what we do. Tall buildings are okay with us. We can also install gutter guards and leaf screens to help keep debris out of your gutter. Gutter guards prolong the time span between gutter cleanings. They make the HOA gutters easier to clean too. Because they are screens covering the gutters all we need to do is clean off the screens. That’s faster than scooping rotting muck from out of the gutters. And since the gutters are not collecting the muck then the downspout stay cleaner longer too. So if you have maintenance personnel onsite maybe they can handle the gutter cleaning themselves. Always remember to ensure their safety. Have strong, tall ladders, gloves, eye protection, cleaning tools, and all other equipment needed. Cleaning out debris- Once you can reach into the gutters; remove leaves, sticks, nasty rotting muck, and anything else that found its way in there. Additionally, check for blockages in the downspouts. The easiest way to do that is run a lot of water down into it. If it’s blocked then you will have to disassemble it. And clean out the blockage with a long stick or maybe with suction from a shop vac. 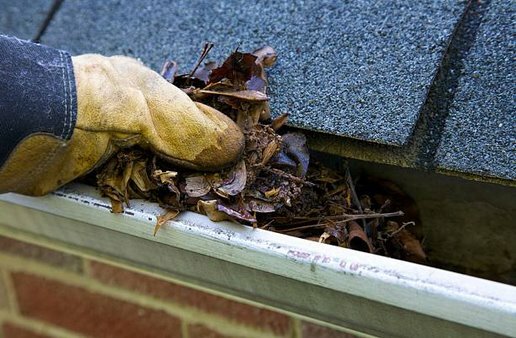 Rinse out the gutters and check them for leaks. After doing your best to clean them out, rinse the gutter and downspout with water. Pro Tip: Make sure to rinse in the direction of the downspout. Seems simple enough but you’d be surprised how many people get this wrong. Repair any leaks you find. So if you find a leak it’s important to fix it as soon as you can. There are lots of creative ways to fix a gutter leak but there are only a few ways to do it right. Why waste your time on temporary patches when you can do it right the first time? But you have to know what those right ways are first. And have the proper tools and know how. If you don’t have personnel or the required safety equipment and tools, then know that we do. So call us. We’ll do the job for you fast and safe. And it will be done right the first time. Gutter cleaning, leaf screen installation, and gutter repairs. We understand the needs of HOA property managers. Whether it’s gutter cleaning and maintenance or complete new gutter systems. We handle everything from apartment and condo complexes to large unit HOAs. We carry Workers Comp. Insurance and specialty liability insurance to cover HOA gutters and rental units. We service all of San Diego County. We’re in the rain gutter business for the long haul. Meaning, we want to build long lasting relationships with HOAs, property managers and investment owners; people who know the value of quality work and reliable service. Our professional crews complete projects without inconvenience to management, owners, or tenants. We invite you to try our services and see why AAA Pro 1 Rain Gutters is your number one choice for HOA gutters. Call, text or email me for a free onsite quote. With AAA Pro 1, your HOA gutters project is in good hands.